I will never forget the first few times I waited anxiously as my Dad’s desktop computer logged into AOL. Dial-up internet was a novelty at the time, so it bothered no one that it took several minutes to connect. A researcher at heart from a young age, I was aghast at the miracle of having everything right there at my fingertips. It was a stark contrast from a couple of years prior when I remember being surrounded by about 123 ancient books I checked out from the library to do research for my project on the assassination of President John F. Kennedy. The process of learning to type papers and essays for school didn’t take long at all, and was a vast improvement over the days when I hand wrote that same exact 20-page paper about South Dakota seven time to get it right. Technology has changed the way we communicate, live and learn. Young students are learning to perfect their typing skills in school instead of practicing their cursive. Their homework is done on the home computer, laptop or personal device instead of in notebooks. There is no question that technology has changed, and will continue to change, the face of education in our country. 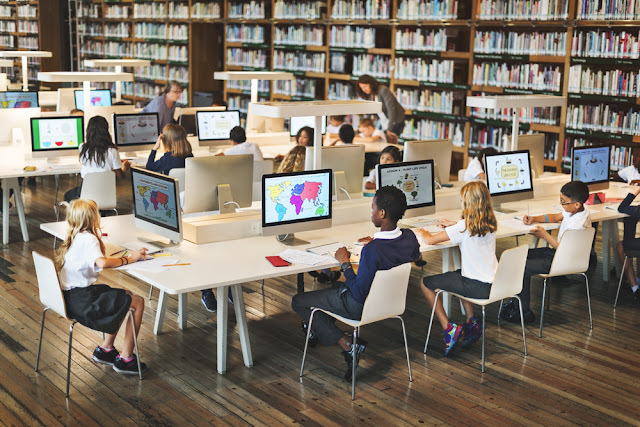 “Future Ready Learning” is the foundation for the 2016 National Education Technology Plan produced by the United States Department of Education’s Office of Educational Technology. The National Education Technology Plan, a 106-page document developed for teachers, administrators, policy makers and teaching preparation professionals, sets into place a call to action to unite as we work to achieve the vision for learning enabled through technology. In the meantime, technology of today has already changed our education in a variety of ways. 1) The sooner the better. Technology is in the hands of our nation’s youth sooner than ever before. In a country focused on bridging achievement gaps, the White House has even issued research and reports on the importance of considering early childhood education as an investment in the future of our country. With innovations in educational apps available on relatively affordable (and therefore attainable) devices, it is not unusual to see a two-year-old tracing letters on an iPad or counting beyond ten as they pop bubbles on an Amazon Kindle. 2) It’s not just the devices. The advancements in technology have made for major improvements to the quality of learning, even as early as infancy. Interactive toys that help children learn gross and fine motor skills all aid in laying a foundation for lifelong learning at about as early an age as possible. 3) There’s something for everyone. Considering the issue of achievement gaps in this country, this is a crucial and imperative change in education in the last 20 years. Students with autism or other cognitive disabilities are now able to learn and communicate in ways they may otherwise may never have been able to. There are also online resources for students to turn to for 24/7 help with homework, like writing essays or proofreading. 1) The bottom line. Anyone who has owned a cell phone recently knows firsthand the struggle to keep up with the latest and greatest technology. Devices become outdated overnight, putting additional strain on already challenging budgets at the local level. School funding formulas are at a breaking point right now across the country, making it incredibly challenging for schools to keep up with maintenance projects and infrastructure, let alone making sure every student has the latest Google Chromebook. 2) The grey area. Most parents of small children walk that fine line of balancing screen time with their children. It’s defined differently from one home to another, but research confirms that too much screen time damages the brain in the long term. It is crucial for healthy, balanced growth and development that learning take other forms in addition to technology, which should not be the sole source of education. 3) Staying engaged. Generally speaking, education happens through many more mediums than ever before. From Smartboards and devices, to power point presentations and videos, teachers are faced with options as they work to keep children engaged in the classroom. When students can Google almost anything, teachers are challenged to dig deeper and explain why they need to know or understand a concept. I had a science teacher in grade school who joked he was constantly feeding his brain cells. Be it with the physical nourishment of a healthy, balanced diet or through knowledge, he said he was always fueling himself in one way or another. Technology has indeed changed a lot about education in our country, and will continue to do so. But ultimately it is only a piece of the greater puzzle of education that we must not lose sight of as it continues to evolve around us. Because looking back, I learned a lot of valuable lessons in books from the library. I learned the importance of dedication and hard work as I handwrote all of those drafts. Let’s be honest – there really is no app for that.